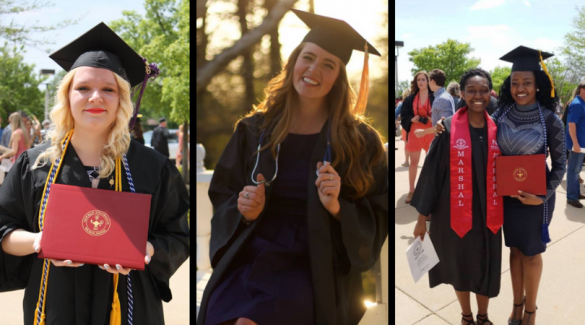 After years of shuffling around textbooks, completing group projects and pulling all-nighters to finish research papers that should have been done long ago, the hard work of earning a college degree has finally paid off for the 2017-2018 Newman graduates. Some are off to continue more years of education, research projects and writing, but these five graduates are diving straight from graduation into their careers. 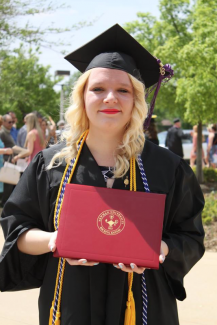 Graduate Miranda Hejny, who earned her Bachelor of Arts degree in communication, landed a job with the Wichita State University (WSU) Security Office. Assistant Professor of Criminal Justice Kristi Edwards was helping Hejny search through jobs when they discovered the opening for a position with the security office at WSU. Both felt it would be a good fit and transition from Newman, Hejny said. Hejny starts orientation for her new position on June 4 and will do ride-alongs until she completes her 14-week police training program in July. Upon finishing her training, Hejny will return to the WSU campus and start work as a security driver. Emily Nahr, who graduated with a Bachelor of Science degree in nursing, starts orientation for her position as a registered nurse at Northwestern Memorial Hospital in Chicago on Aug. 13. Nahr’s duties will include but are not limited to providing hands-on care to patients by administering medications, managing their IV lines and monitoring for changes in their current medical condition. Additionally, she will document the care she provides while communicating with the other health care professions that are also caring for her patient. 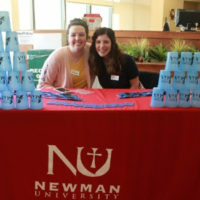 Nahr said that Newman University helped prepare her for the next step. Without the Newman nursing program, she would not have been able to learn the skills and knowledge she has now, she said. 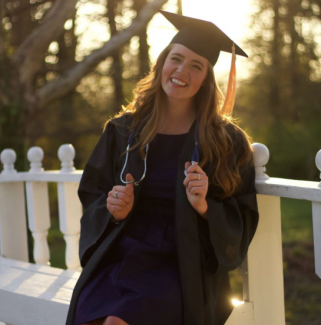 “I may not have been able to pass the NCLEX on my first try, had it not been for the nursing program,” she said. “The nursing professors at Newman are with you every step of the way. They would stay late after class and explain topics to me or other students if we didn’t understand. I even received emails from them congratulating me on my new RN license. 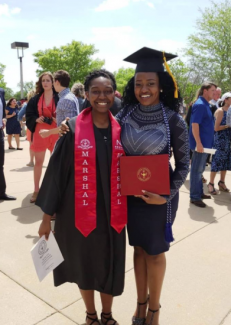 Precious Howard graduated with a Bachelor of Science degree in both psychology and sociology and plans to enter the military — specifically, the United States Air Force. For the time being, Howard is living at home in Topeka, Kansas, and is waiting to hear back about a job position she recently applied for. If she does not receive the position, she has decided to go forward with joining the military, she said. Howard said her goal is to make use of her psychology background while in the Air Force. Once she speaks with her recruiter, Howard will choose which area in psychology she would like to focus on for her master’s degree, she said. Howard added that she is eternally grateful for all of the scholarships she received while at Newman. Makaylah Perkins, who received a Bachelor of Science degree in both criminal justice and psychology, starts at the 911 Call Taker Academy on June 11. Perkins first applied for the position through Kansas HRePartners, and then completed an observation session and an interview, she said. After the 911 center conducted a background check, Perkins was required to complete both a physical and a drug test. “The academy will be like school, so I will have to study and take a few tests that I have to pass in order to continue on,” Perkins said. Perkins also plans to continue her education online at WSU in August and is pursuing a master’s degree in criminal justice. 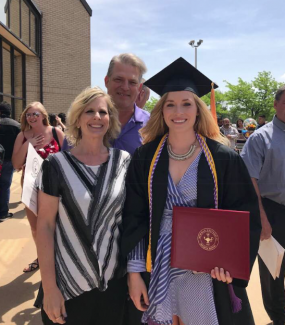 Sarah Peterson, who recently graduated with a Bachelor of Science degree in nursing, will begin as a labor and delivery nurse at Medical City Dallas in her hometown on July 12. Peterson said she found Medical City when she searched online for the best labor and delivery hospitals and, as a bonus, knew someone who worked in the Neonatal Intensive Care Unit (NICU) there. Her two-year contract with the hospital will allow her to gain work experience on the delivery side as she helps new mothers through the entire delivery process, she said. 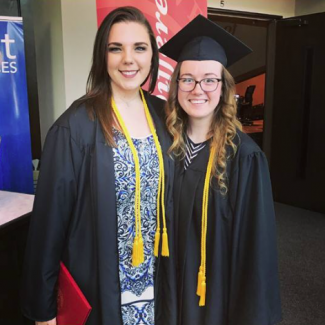 “I am so thankful for the opportunities the Newman nursing program gave me, as well as for the skills that have equipped me to practice as a safe and competent nurse,” Peterson said. To read more 2017-2018 Newman graduate reactions, reflections and future plans, click here.